Eye Health | Visionary Eyecare's Blog: "The Eye Journal"
Visit http://www.Acuminder.com to Sign Up! Do you need help remembering when to discard your disposable contact lenses or when to see your eye doctor for your yearly eye exam? 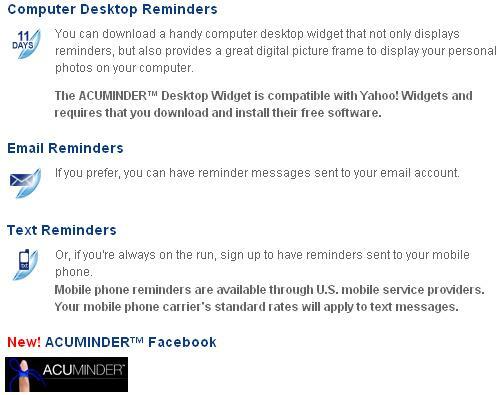 Well you can go to www.AcuMinder.com and register for this FREE service to get reminders sent to you via Email, text message or a computer desktop widget to help you remember. They even have a new Facebook application that will help you remember! Getting an annual eye exam is very important in maintaining the health of your eyes as well as keeping your vision as clear and crisp as possible. Also it is vital to discard your contact lenses every 2 weeks or when your doctor recommends the lenses to be discarded. Often contact lenses can feel “fine” and many patients come in and tell Dr Dawn Bearden or the other Visionary Eyecare Doctors that they don’t throw away their contacts until their vision gets blurry and/or their contact lenses start to bother them. This can be very dangerous. Contact lenses act like little sponges that can soak up bacteria, fungus, viral particles, mucus, debris, smoke and other environmental agents. Even if you clean your contacts every night – these agents do build up on your contact lenses each and every day. Cleaning them nightly often does not get rid of 100% of these irritants. These irritants build up – day in and day out….so its important to discard the lenses and put in a new pair – even if your eyes feel “fine”. When contact lenses are not discarded on schedule – patients can come in with distortions on the front of their eye (on their cornea) or develop allergies to the contacts. Most of the time, patients are not yet aware that these issues are even happening until its too late. Some of these issues can lead to lifelong problems with wearing contacts. Sometimes a picture is worth a thousand words!! And sometimes that picture is made from a thousand words….. 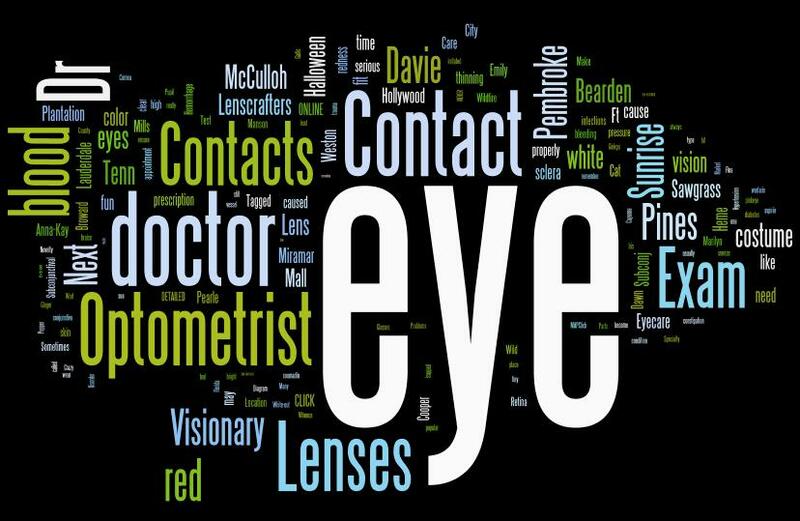 Here are some visual representations of the Visionary Eyecare Blog from Wordle. 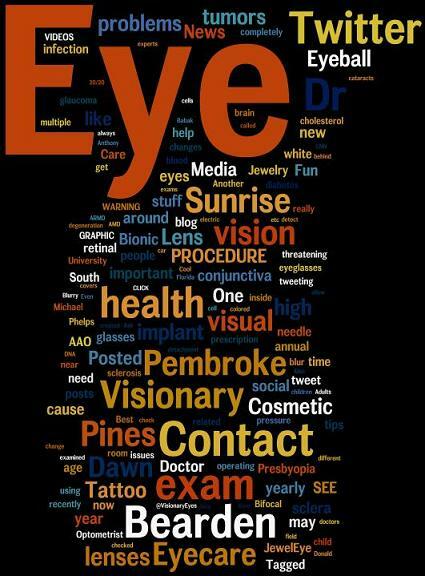 It visibly shows that our blog talks about the Eye, an Optometrist, an Eye Exam, Pembroke Pines, Sunrise, Eye Dr, Contacts, Dr Dawn Bearden, Dr Emily McCulluh, Dr Anna-Kay Tenn, Lenscrafters, an Eye Doctor, Vision, Eye Care, Eye Health and more…. 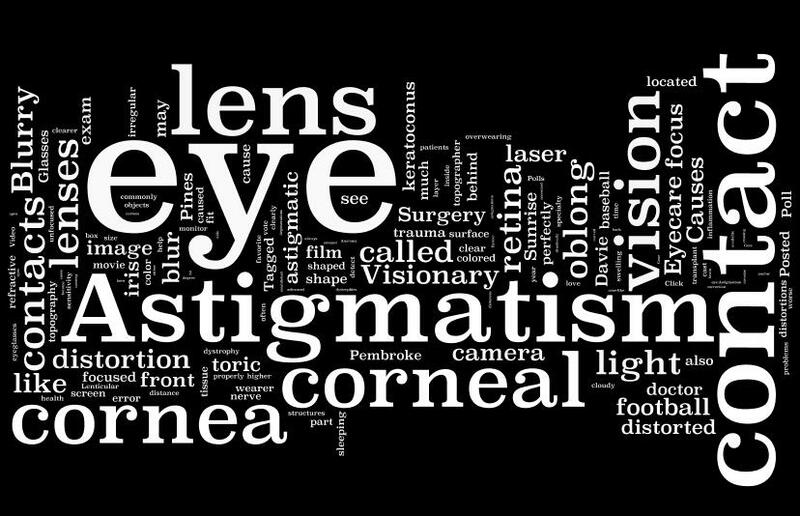 Just by scanning one of these images – a reader can immediately get a feel for what the Visionary Eyecare Blog is all about!! As reported on Twitter by Prevent Blindness America and Prevent Blindness Florida (@PBFlorida), the Florida House of Representatives adopted HR 9095, a resolution recognizing the seriousness of sports-related eye injuries in children and the importance of sports eye safety to protect the children of Florida. Eye injuries are the leading cause of blindness in children in the United States, and 90% of these injuries can be avoided with the use of protective eyewear. Prevent Blindness America applauds the Florida House of Representatives for their commitment to children’s eye health. For more information about sports eye injuries and how you can protect your child’s sight, visit the children’s sports eye safety section of the Vision Learning Center. For a copy of the adopted resolution, click here. Dr Dawn Bearden, Dr Anna Kay Tenn, Dr Emily McCulloh and Dr Alyx Lin at Visionary Eyecare in Pembroke Pines and Sunrise routinely ask about children’s sports and hobbies during the medical and social history portion of the eye exam. Children under the age of 12 are routinely given a prescription for polycarbonate lenses for their eyeglasses. This polycarbonate material is more impact resistant – which is important for children due to their active lifestyle. If a child participates in any impact or ball sport – then the eye doctors at Visionary Eyecare will also recommend sports goggles for eye safety. Sports goggles are excellent for protecting your eyes (in BOTH adults and children) while playing any type of impact or ball sport such as basketball, racquetball, soccer, baseball, softball, tennis, rugby etc. Many eye injuries can occur from a ball or racket hitting you in the face near the eye – or an impact with another player’s elbow, knee, head etc. while playing the sport. Some serious eye health issues that can occur from these impacts include retinal detachment, subconjunctival hemorrhage (bright red blood spot on the white of the eye), ocular inflammation (iritis/uveitis) and even cataracts or glaucoma that can occur YEARS after the injury to the eye. In persons under 25 years of age, ocular trauma is the number one cause of visual loss. 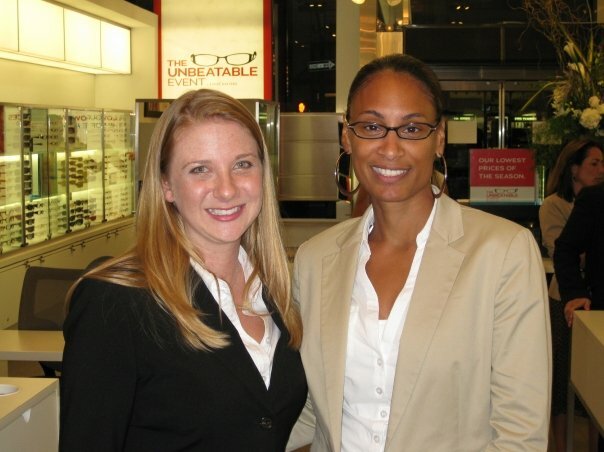 In August, LensCrafters hosted a private in-store event for BlogHer bloggers in the NY area to teach parent bloggers about the importance of eye health and style for themselves and their families. 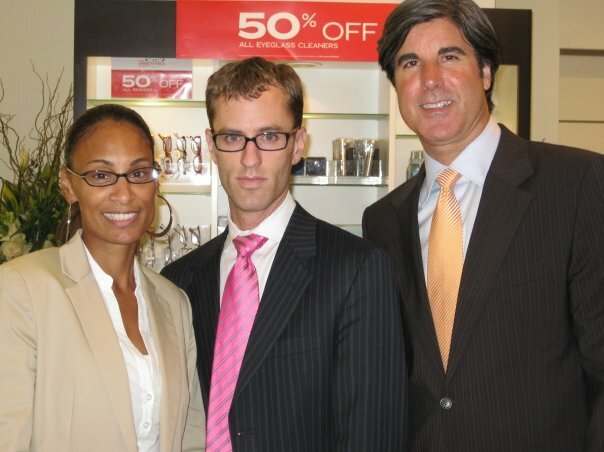 The event was held at the Lenscrafters flagship store in Manhattan on 5th Ave in New York City. Bloggers also received tips from LensCrafters on how to make the most out of eye exams and best practices in working with eye doctors. 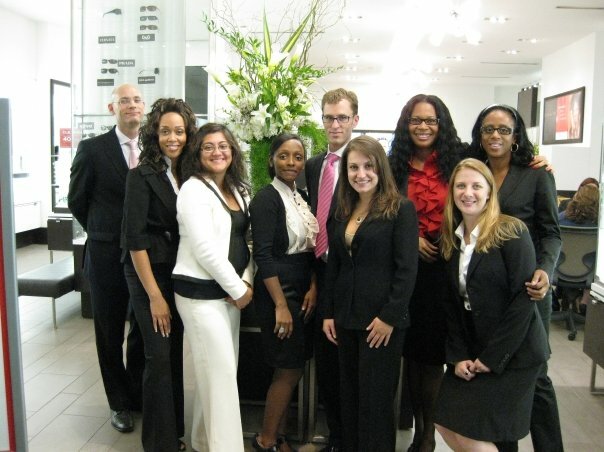 The event was led by LensCrafters’ VP of Eyecare, Dr. Eliot Grossman and Dr. Shirlie Dowd. Additional LensCrafters’ Eye Doctors were on hand to mingle with Bloggers and conduct eye exams throughout the event. Style experts were also on hand to help Bloggers to select the right style frames for their face and the best lenses for them. On the August night in Manhattan, BlogHer’s gathered with the folks from LensCrafters to enjoy some good company, learn some things they didn’t know about eye health, try on new frames with the help of stylists and basically have a pretty good time doing it. They’ve captured the event in their blogs and we think you’ll be surprised by what they each took away from the experience. From enjoying gourmet treats to the personal attention from all of the LensCrafters staff at the event, all of the bloggers had a wonderful time learning about eye health and eyewear fashion! !